The press release about Wells Fargo’s initial Talking ATMs in California was issued as a result of the Wells Fargo California Settlement Agreement. The agreement was the first in the country in which a bank agreed to install Talking ATMs at every location in a single state. It was negotiated using Structured Negotiations by Lainey and co-counsel Linda Dardarian on behalf of the California Council of the Blind and individual members of the blind community. The Disability Rights Education and Defense Fund (DREDF) also represented the Claimants. San Francisco, California (April 19, 2000) — Wells Fargo and the California Council of the Blind announced today that 20 Wells Fargo Talking ATMS are now up and running in the Bay Area, Los Angeles and San Diego areas. A list of the Talking ATM locations is at the bottom of this message. Through voice instruction, the new Talking ATMs tell users who cannot read information on an ATM screen how to deposit money, withdraw cash, transfer funds and buy stamps. 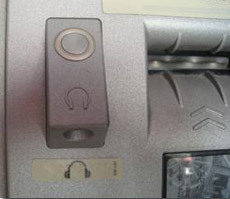 The ATMs have audio jacks to deliver voice information privately to protect the security of blind and low vision users. Working with the California Council of the Blind to meet the needs of an important and under-served segment of customers who are vision-impaired, Wells Fargo announced on June 23, 1999, that it would pilot 20 Talking ATMs in the Bay Area and Los Angeles and San Diego counties this year. After the successful completion of the pilot, Wells Fargo will install a Talking ATM at each of the more than 1,500 Wells Fargo ATM locations in California. Catherine Skivers, president of the California Council of the Blind, said, We are excited that Wells Fargos Talking ATMs in the pilot locations are ready for use by the blind and visually impaired people and we applaud the work that Wells Fargo has done over the past months to make these machines a reality. In California, Wells Fargo — a diversified financial services company — provides banking, insurance, investments, mortgages, and consumer finance from more than 1,300 stores and other distribution channels.